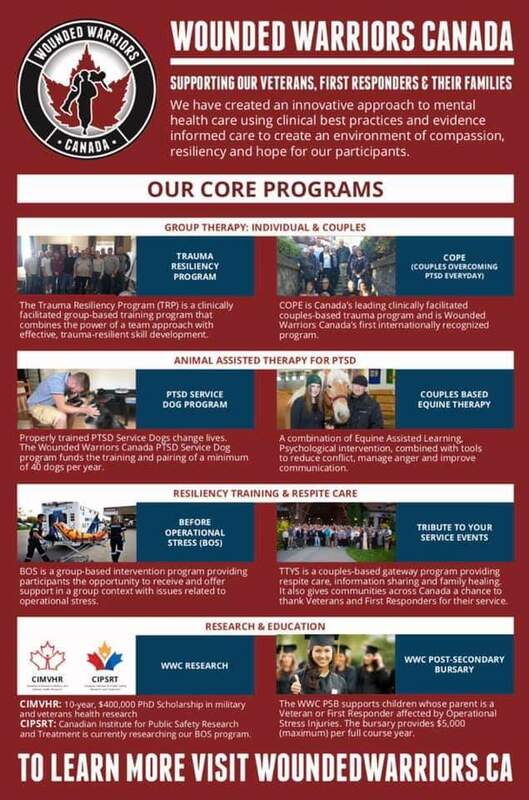 On April 11th 2019, Enjoy a Burger & Beverage at the NCO’s Mess in support of Wounded Warriors Canada! The “E” Division NCO’s Mess will be hosting a Burger and Beverage event to sponsor Nigel and Peter in their fundraising for Wounded Warriors Canada. Please RSVP to encomess@rcmp-grc.gc.ca by April 5th 2019 with names and number of guests. 2) Cheque payable to E Division NCOs’ Mess can be sent to Attn: Burger & Beverage, Mailstop #1305, 14200 Green Timbers Way, Surrey BC. The Mess will be open for everyone, as usual, on Thursday April 11th 2019. Tickets for the Burger & Beverage can be purchased on site for $25, while quantities last. 50/50 and Prize draws will be conducted at 19:30 and anyone present is welcome to participate. For further information on this event, contact Nigel Blake or Peter Hamming on Groupwise.